How to calculate the number of parameters of AlexNet? this results in a total amount of 62378344 parameters. Is that calculation right? According to the diagram in their paper, some of the layers use grouping. Therefore, not all features of one layer communicate with the next. This means e.g. for conv2, you should have only (5*5)*48*256 + 256 = 307,456 features. I'm not sure if all newer implementations include the grouping. It was an optimization they used to let the network train in parallel on two GPUs, but modern GPUs have more resources for training and fit the network comfortably without grouping. Not the answer you're looking for? Browse other questions tagged computer-vision conv-neural-network or ask your own question. 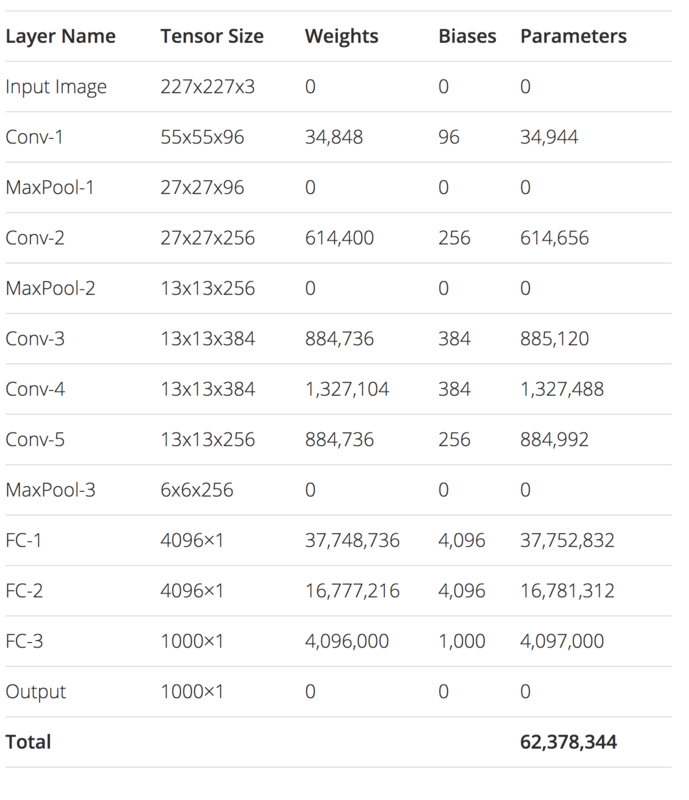 How to calculate the number of parameters of convolutional neural networks? What kind of features are extracted with the AlexNet layers? How to segment bent rod for angle calculations? TensorFlow CNN: Why validation loss are significantly different from the start and has been increasing?